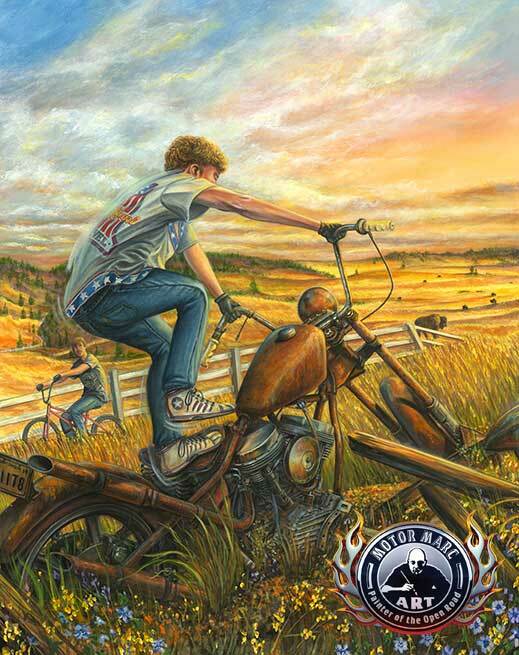 Motor Marc’s featured painting for the 78th, 2018 Sturgis rally is the second piece of art from a new series which embody his childhood experiences with a South Dakota twist. Racing along through the countryside’s golden plains brings new findings for another adventure. A vintage and rusted motorcycle sparks imagination as the boys play out fantasies of being Evil Knievel. Dare devil kid of the motor boys club balances himself as he imagines he’s soaring in the sky attempting his biggest stunt yet. 18" x 24", 24" x 30", 32" x 40"